Glaucoma is a very common eye disease that affects millions of people. If it is never diagnosed or treated it can lead to complete blindness. The sign and symptoms of glaucoma can easily be missed without proper examination. It is a condition in where fluid pressure inside the eye builds to high levels. This pressure within the eye is called intraocular pressure, and increases the chances of optic nerve damage. Glaucoma is a slow developing disease that usually span over many years. As is expands many people do not experience any symptoms. Elevated pressure may even be the first sign of glaucoma. It is advisable to have regular eye exams to ensure it is detected early on. Fluid buildup within the eye increases which leads to intraocular pressure and develops to become glaucoma. The front section of the eye contains a watery fluid, aqueous humor, which continually flows bringing nourishment to many part of the eye. When functioning properly that watery fluid drains through a system called trabecular meshwork, which is located where the cornea and iris meet. 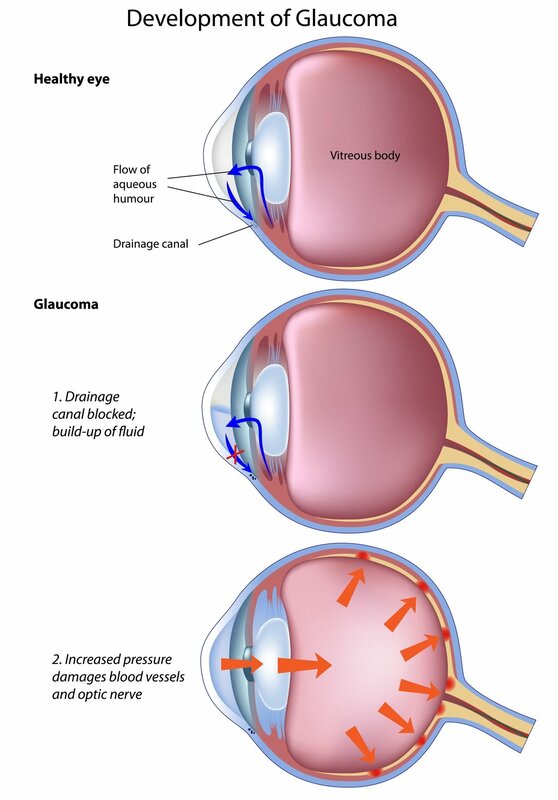 For glaucoma to occur that drainage area becomes blocked causing pressure to build up. If that pressure is left to build up over time optic nerve damage will occur. If nerve cells begin to completely die that will cause permanent vision loss. There are many different types of glaucoma but a high percentage of people suffer from the most common type, which is Primary Open Angle Glaucoma. Millions of individuals suffer from glaucoma, through to consequence of their own. There are some risk factors that can increase the potential for it. There is no cure for glaucoma, but with proper treatment there is a high probability of controlling it. A person with glaucoma will have to treat and monitor it for the rest of their life. This is when it is most important to maintain regular visits to your eye doctor and followed your treatment plan. The typical case of glaucoma is treated using a variation of drugs that are meant to lower the pressure within the eye. Eyedrops are the typically application form. In severe cases laser surgical procedures are required to minimize the pressure. How often are eyedrops applied for glaucoma treatment? Depending on the medication that is prescribed to you they may need to be administered several times a day. Can my glaucoma medication change? Glaucoma is a progressive disease, meaning that your prescription may need to be change by your eye doctor. The main concern is to maintain the pressure within your eye and if it is advantageous to add or change your eye drops solution your doctor will do that. A second concern is the side effects of altering your medication which should be monitored by your doctor and reporting by yourself as well. Lifestyle hindrance – is your daily life being interfered from the medication. Follow your doctors’ instruction strictly. Be candid about the side effects you are feeling. Maintain a large enough supply of medication at all times. Scheduled regular appointments with your eye doctor. Inform all doctors about medication you are taking. Be informative to family members about their eye health.